Many people may never have heard of FTD. It makes things harder for families like ours when people don’t understand what FTD is. Connor and I think that more people need to know about FTD. 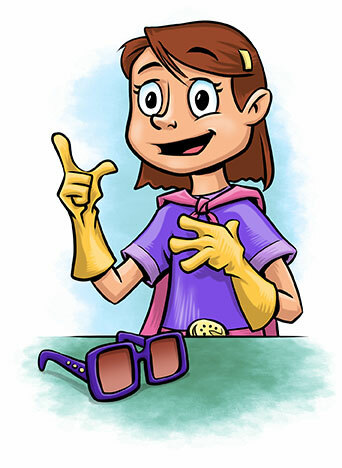 There are lots of things kids can do to tell other people about FTD. We can even raise money to help find a cure. These are ways we can be Super Heroes for others! It feels great to teach people about FTD. When you do, friends, kids and teachers at school and people in your community can understand better what your family is going through. The more people get involved, the more support there is for better services and for research to find a cure. Join Sophie and Connor’s mission to raise awareness. Take a look at what other kids are doing. 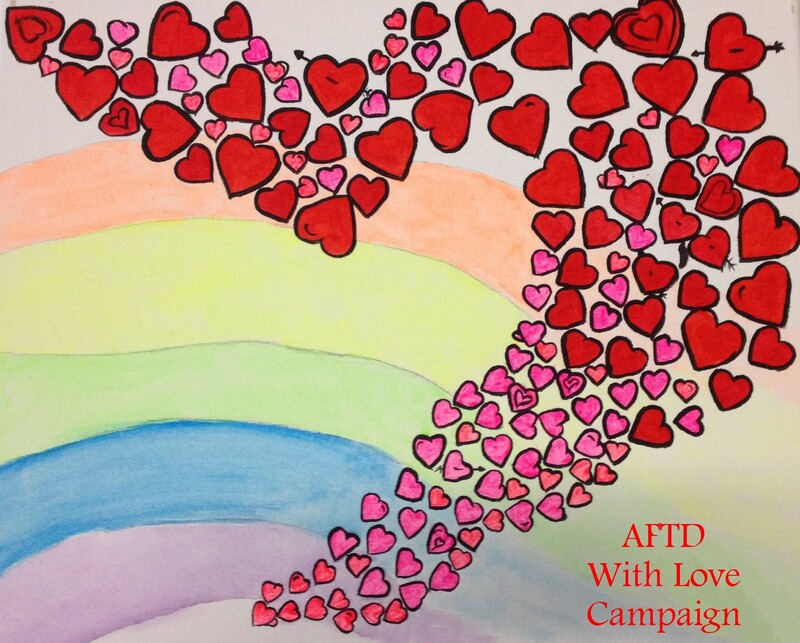 If you have an idea or are planning an event, tell the AFTD Team (kidsandteens@theaftd.org). They’d love to help in any way they can and will add it to this page to inspire other kids, too. Don’t forget to visit the teens’ What’s Happening page to see what older kids are doing, too. Look at the Super things kids are doing! Rummage and Bake Sale – Katelynn Webb and her friend Savannah helped Katelynn’s mother and grandmother host an all-day rummage and bake sale in Phoenix, Arizona. The event brought together artists, food, and wares of all types while increasing awareness of FTD and raising funds for AFTD. The event raised $1,835. Katelynn’s grandfather died in 2013 from FTD. Tasty, Electronic Cupcakes? 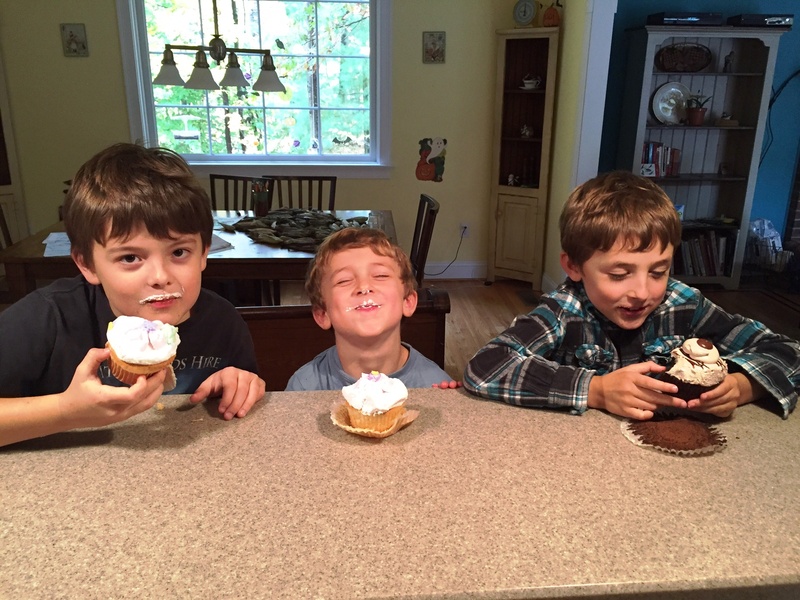 For their Food for Thought event, Ed Fitzgerald’s grandkids Jack, age 8, Harry, age 6 and Tom, age 10, made and sold electronic cupcakes to friends and family to raise awareness of FTD. Then they baked real ones for a party with Grandma at their home. The event raised $235. Cindy’s Cakes – Sophia Morabito, age 9, (center) and her friends helped to bake and deliver cakes as part of her mother’s Food for Thought event. 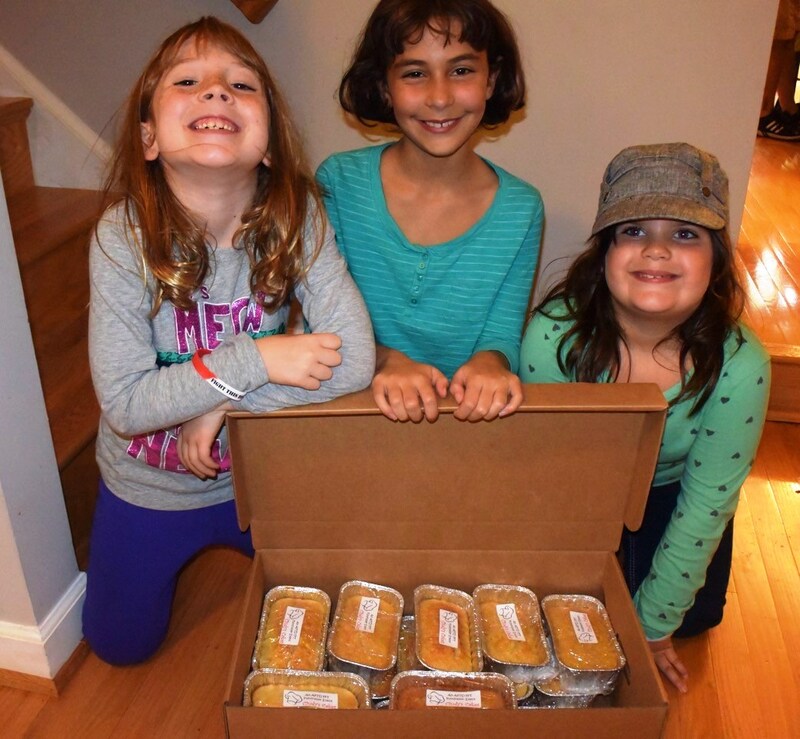 In October 2015 Cindy’s Cakes, named in memory of Sophia’s grandmother who had FTD, raised $1,013 distributing homemade cakes throughout Central Maryland. A Painting and More! Alexa Fernandez, age 8, and her mom painted a canvas for her Nani’s room. 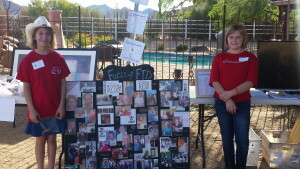 Alexa decided that she wanted to put her painting on shirts, magnets, and totes to bring awareness to FTD. 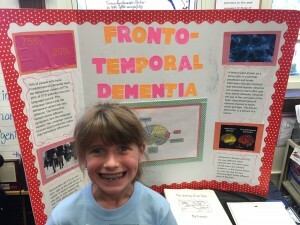 Launched in May 2015, Alexa is selling the items at her Nani’s nursing home, and to family/friends for an extra $5.00 per item to donate to AFTD. She named it her “With Love Campaign” because of the hearts and rainbows. Food for Thought Lemonade Stand – The Kimble Family got excited about the second annual National FTD Awareness Week in October 2014. 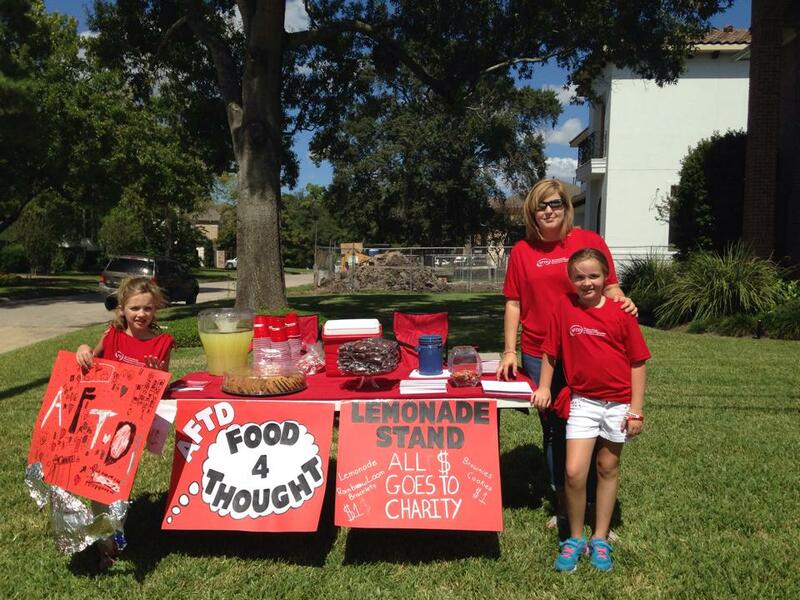 Joy, 9 and Katherine, 7 decided to hold a lemonade stand fundraiser for AFTD’s Food for Thought Campaign. The girls raised $268 in memory of their grandmother to support the cause! School Citizenship Project – As part of her fifth-grade citizenship project Eva Martin taught her classmates and their families about FTD. 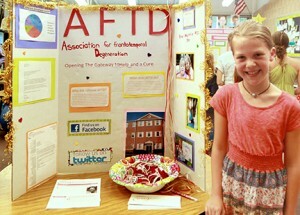 Eva sewed aprons and other items and sold them at the school expo. 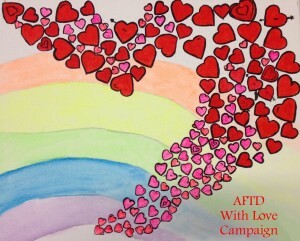 She raised $400 for AFTD! Eva’s nana had FTD and passed away in 2010. Walk-a-Thon for Rachel – Olivia and Jason Goldring’s mother died of FTD in 2012. They planned a walk-a-thon on their school campus with elementary school kids and teachers in memory of their mother Rachel. More than 500 people participated. 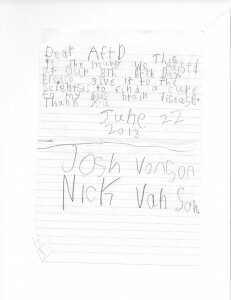 When all the pledges were collected they had raised over $8,000 for AFTD. 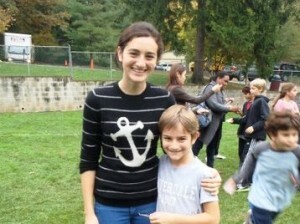 Baseball Catch-a-Thon – Max Portnoy, age 12, from Maryland loves baseball. He also loves his grandfather, who is affected with FTD. 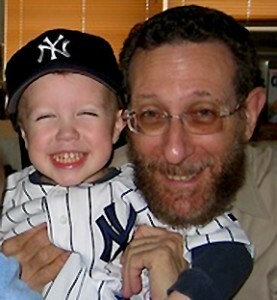 In conjunction with his Bar Mitzvah, Max wants to raise money to help find a treatment and cure for his grandfather’s disease, as well as provide support for others who are caring for a loved one with FTD. Max’s “catch-a-thon” was March 23, 2014. To see a TV news report on the event click here. 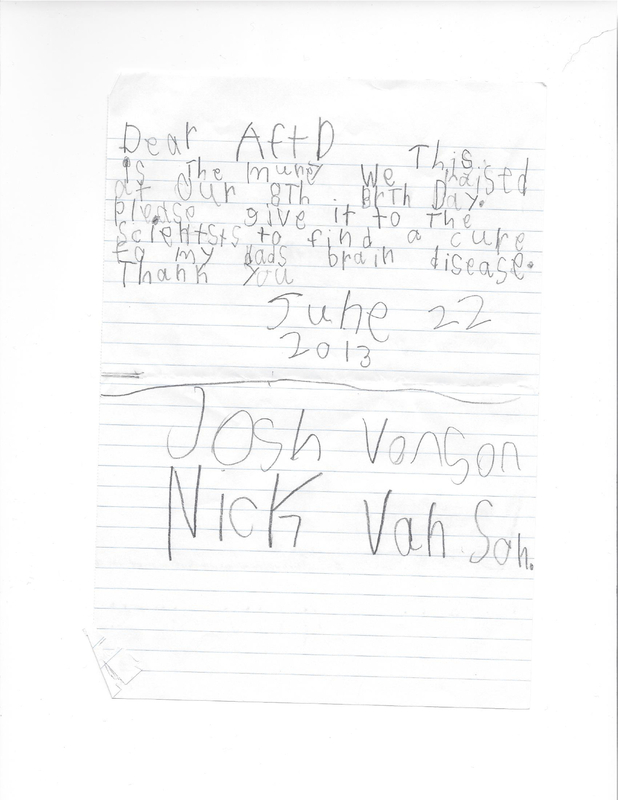 Birthday for a Cause – Instead of receiving birthday gifts, Josh and Nick Van Son asked friends to donate money to FTD research on their 8th birthday in 2013 to honor their father, Jeff, who passed away from FTD the year before. Dementia Science Hat – Athena N. was given the assignment in her second grade science class to choose a science word that could be made into a hat for the school’s Science Hat Parade. 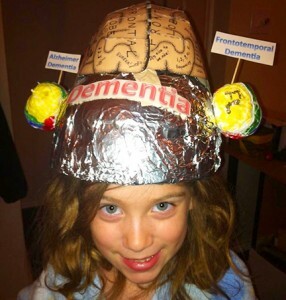 Athena chose the word “Dementia” to teach others about the areas of the brain that change when someone has FTD or Alzheimer’s Disease.